A young Silicon Valley start-up just launched a product of arguable novelty. This product is a dispenser customized with some edgy additional features such as the Wi-Fi, several cameras and an app. The start-up, named Bodega, created a fancy looking vending machine filled with various products. The goods chosen to fill each of the machines vary depending on, firstly, the location and, secondly, the choices the users make over time. The one hundred non perishable goods a machine can contain are restocked in accordance with the knowledge the machine progressively collects about its customers. Therefore, this is a machine set up to serve a rather limited number of regular customers. For now, the company’s plan is to start with stocking few thousands of various goods that will make up different combinations of products across their machines. From the beginning, the machines are filled with products related to the location they are placed at. Indeed, the products needed will be different from a corporate headquarters’ break room than from the lobby of a residential building. In practical terms, the machine is to be used with Bodega’s smartphone app, that will require users’ credit card details and give them a digit number in order to open the machine’s doors. Once the doors are open, the cameras in the machine record users’ face and the product(s) they select. As soon as the doors of the machine are closed, the app automatically withdraws the amount of money corresponding to the product(s) from the users’ credit card. Therefore, this is an operation totally freed from any human interaction. The machine, with the help of the data from the cameras and the app, progressively learns the preferences of each of the individuals using the machine. Eventually, the machine would create its own specific filling plan. Hence, what differentiate essentially Bodega’s smart machine from a regular vending machine is not the fact that the products vary from one environment to another (standard vending machines mostly already follow this rule), but the fact that the machine adapts its products and their quantities to its users. Bodega’s “machine learning” (the creators actually refuse the designation of vending machine for their product) was created by two ancient Google employees, Paul McDonald and Ashwath Rajan, with the purpose of shrinking at the most the distance people have to do to get the few products they urgently need such as a late night snack or a pack of nappies. Ultimately, according to co-creator Paul McDonald, retail stores won’t be necessary anymore, thanks to the thousands of Bodegas they are hoping to set up all around American cities. Although the idea might have seem appealing on the paper (the start-up received two millions five hundred thousand dollars of funding from a handful of senior executives at Facebook, Google, Twitter and Dropbox), a good few critics argue the viability of Bodega’s business plan, mainly in regards to the logistics. Many questions arouse such as, where will be the stocking locations; how many people will be working solely for the restocking of the machines; what will be the frequency of the restocking; how many more skilled people will be necessary for the technical maintenance of the machines etc. But other than the critics from “tech people”, the company had to face an impressive backlash from the public, which mostly happened on Twitter. The name Bodega, which can be roughly translated into “shop” or “warehouse” in Spanish, refers to the name of the long-existing twenty-four-hour convenience stores owned by immigrant families, mostly Hispanic, situated at every corner of American metropolises. Thus, with an astounding irony, McDonald and Rajan named their brand after the shops they would supposedly make disappear from the urban landscapes. If the name is indeed a good example of cultural insensitiveness, there is another reason why Bodega provoked such negative response from the public. 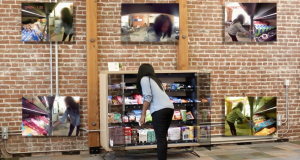 Bodega is another (among many others) technology that seem to aim at replacing humans by machines and, consequently, lessening human interaction. The public sees Bodega as a threat, if not an attack, to their beloved corner stores which are an integrant part of the big cities various neighbourhoods’ life and culture. Although the public’s negative reactions towards developments of the automation of work, today’s automatic cashiers at Albert Heijn and automated check-in and check-out desks at libraries are well and truly on duty, twenty-four hours a day if we need them to. The automation of work scares the public, justifiably. People’s fears of technology grow accordingly with technical breakthroughs giving the machines more and more potential to take human job and incomes. Shestakofsky claims that the automation of work clearly transformed human work both in bad and good ways, whether by supplementing, substituting, or complicating. In other words, it suppressed some jobs and created others. It uplifted some skills and depreciated others. It can be seen also as “de-skilling” in some cases and “up-skilling” in others (4). Few decades ago, scholars debated on whether the innovations in technology, notably with the automation of work, could eventually significantly diminish the job offer. It was mainly concluded that even though technology can replace human for some positions, it will create new kinds of jobs while implementing better relationships between technology and humans. Furthermore, Autor stressed the fact that technology will never be totally independent from human labour, whether for its implementation, improvement and maintenance. Indeed, there are some tasks requiring tacit knowledge such as “judgement” or “common sense” that the engineers have not yet been able to code (11). However, these last years, the machines gained in complexity and capability. Furthermore, it is of interest to cite McKinsey and Company who coined the term “Automation of Knowledge work”, which refers to computers operating elaborate tasks involving the need of “complex analysis, subtle judgements, and creative problems solving”. 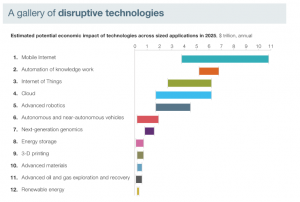 According to them, “Automation of knowledge” is a disruptive technology that has the potential to represent a five to seven trillion dollars economic impact a year, by the year two thousand and twenty five (qtd. in Ryjov, 411). Today, computers can infer rules or judgement with machine learning by processing large sets of data. Therefore, the machines actually learn without being predetermined by the engineers’ coding anymore. Scientists warn the public, as they believe the machines will increasingly take more job positions (Shestakofsky 6). A study by the Americans Frey and Osborn confirms public’s fears by estimating that 47% of American jobs will be threatened by computerization within ten to twenty years (qtd. in Folarno and Halpern, 39). Today, two theories are facing each other in relation to the future of work. The discontinuity theorists claim that the historical duality between technological innovation and job creation is about to be interrupted by the machine learning and artificial intelligence. On the contrary, the continuity theorists are convinced that the complex relationships between humans and the machines will go on, very possibly modified, but uninterrupted. According to them, the alleged autonomy of machine learning and artificial intelligence in the discontinuity theory is a way of ignoring the tremendous work accomplished by humans in computing and maintaining these complex programs. Therefore, they believe in the idea of a continuity in the relationships between humans and machines (Shestakofsky 8). However, it is important to note that even if the machine learning and artificial intelligence do not mean the end of the human work, critics argue that it will probably engender changes and displacements in certain job categories which might deteriorate the working conditions (Folarno and Halpern 40). Now, whether Bodega’s machine is a doomed product or not (it is, according to many tech experts, critics and journalists), it is still interesting to assess the several reasons that provoked such a violent rejection from the public. In addition to use the informal branding of a vulnerable community, Bodega meets directly with public’s fears regarding automation of work. The public sees a tech start-up willing to create “on the edge” machinery that, in addition to putting people out of work, does not hold any essential utility or does not respond to any demand other than the pressing and constant needs of Silicon Valley for “innovation”, at any price. Autor, D. H. “Why are There Still so Many Jobs? The History and Future of Workplace Automation.” Journal of Economics Perpectives, vol. 29(3), pp. 3-30, 2015. Forlano, Laura. Halpern, Megan. “Reimagining Work: Entanglements and Frictions around Future of Work Narratives.” Fibreculture Journal, vol. 26, pp. 32-59, 2015. Lynley, Matthew. 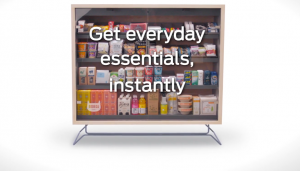 “Bodega raises $2.5M to build a smart store kiosk in your apartment building.” Techcrunch, 13 Sept 2017, https://techcrunch.com/2017/09/13/bodega-raises-2-5m-to-build-a-smart-store-kiosk-in-your-apartment-building/?ncid=rss. Accessed 18 September 2017. Ryjov, Alexander. “Automation of Knowledge Work.” Communications in Computer and Information Science, Springer, pp. 411-421, 2016. Sevran, Elizabeth. “Two Ex-Googlers Want to Make Bodegas and Mom-and-Pop Corner Stores Obsolete.” Fast Company, 13 Sept. 2017, https://www.fastcompany.com/40466047/two-ex-googlers-want-to-make-bodegas-and-mom-and-pop-corner-stores-obsolete. Accessed 18 September 2017. Shestakofsky, Benjamin. “Working Algorithms: Software Automation and the Future of Work.” Work and Occupations , vol. 0(0), pp. 1-49, 2017.